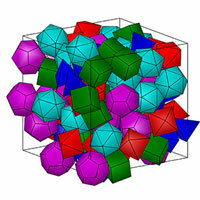 (Nanowerk News) A new paper ("Third-order thermo-mechanical properties for packs of Platonic solids using statistical micromechanics") by a team of researchers led by Karel Matous, College of Engineering Associate Professor of Computational Mechanics in the Department of Aerospace and Mechanical Engineering at the University of Notre Dame, describes how an accurate statistical description of heterogeneous particulate materials, which is used within statistical micromechanics theories, governs the overall thermo-mechanical properties. This detailed statistical description was computed using a novel adaptive interpolation/integration scheme on the nation’s largest parallel supercomputers. Quantifying the morphology of many-body systems has applications in many scientific fields at a variety of length scales from molecular configurations up to structural composites and celestial bodies.